A lot of our clients in the Tampa Bay area have questions regarding how exactly their credit score will be impacted by a short sale, foreclosure, or a bankruptcy. 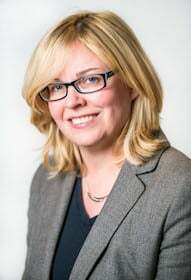 A recent article by FICO, Banking Analytics Blog, researched these very questions. 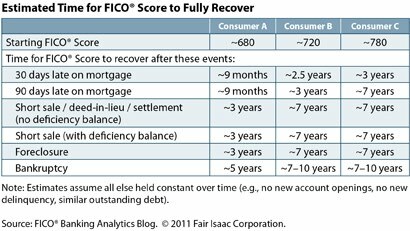 The FICO study focused on three sample consumers with credit scores of 680, 720 and 780. As shown by the charts above, the answer depends a lot on what the existing credit score is. The higher your score is, the longer it appears to fully recover. However, after 18 months of otherwise good credit, this impact may be minimized. As we’ve believed all along, there is no statistical difference between short sale/deed-in-lieu or foreclosure. However, governmental financing may be more generous for a future home purchase if a short sale rather than foreclosure sale occurred. Fannie Mae announced in a News Release in June 2010 that it would restrict governmental financing for future home purchases if a borrower strategically defaulted for seven years after the foreclosure sale.